It’s June and time to fire up the grill! 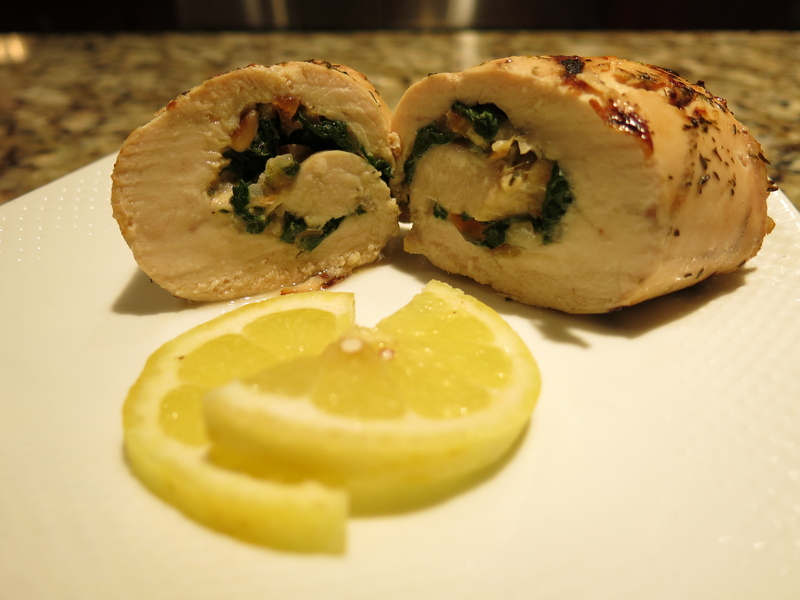 But instead of grilling up plain old burgers and dogs, do something different this week and try out my recipe for Lemon Chicken Roulade! The fact that you roll up the chicken makes it look impressive, and anything with “roulade” in the name sounds super fancy. But in fact it’s really pretty easy to make. The most time consuming part was pitting the cherries. If that sounds too daunting, feel free to swap them out with dried cherries or another dried fruit. Though I have to say that I really did like the subtle sweetness of the fresh cherries (plus they’re Rainier – yum!). I think I’ll skip the commentary today and go straight to the good stuff. As always, try it out and let me know what you think! In a small bowl, whisk together lemon juice, lemon zest, 3 teaspoons of the olive oil, thyme, salt, and pepper. Pour marinade over chicken and refrigerate for four hours, turning once. Heat remaining teaspoon of olive oil in a saute pan over medium heat. Add onion and saute for three minutes, until onions begin to soften. Add spinach and cook until spinach wilts, another 1-2 minutes. Add garlic, cherries, and pine nuts, stirring until the garlic is fragrant, about one minute more. Remove chicken from marinade. Divide the filling in half and spread evenly over each chicken breast. Sprinkle 1 ½ tablespoons parmesan cheese over each breast. Starting from a short end, roll each breast up and secure with toothpicks. Brush grill grates with oil. Grill chicken at 400 degrees for 10-12 minutes each side.